The Server Control utility, RocControl, is a small and unpretentious Python script for controlling basic server functions. This utility is only installed under Linux systems including Raspbian. RocControl has two panels which can be selected with the Control and Automatic buttons. The System panel is shown after start up. 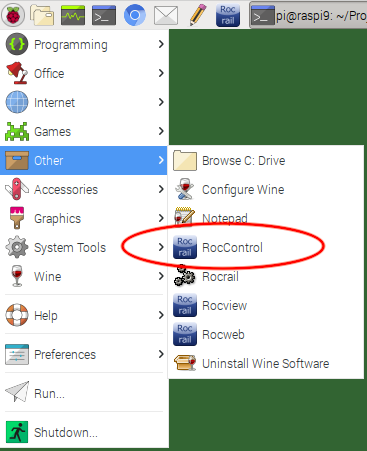 If the Rocrail is running on the same computer as RocControl, the default localhost hostname can be used. 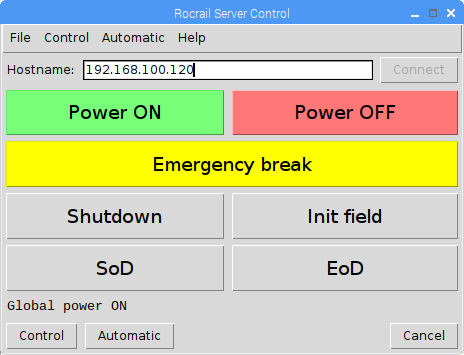 After clicking on the Connect button the connection will be established with the Rocrail Server. If successful the connect button will be disabled.